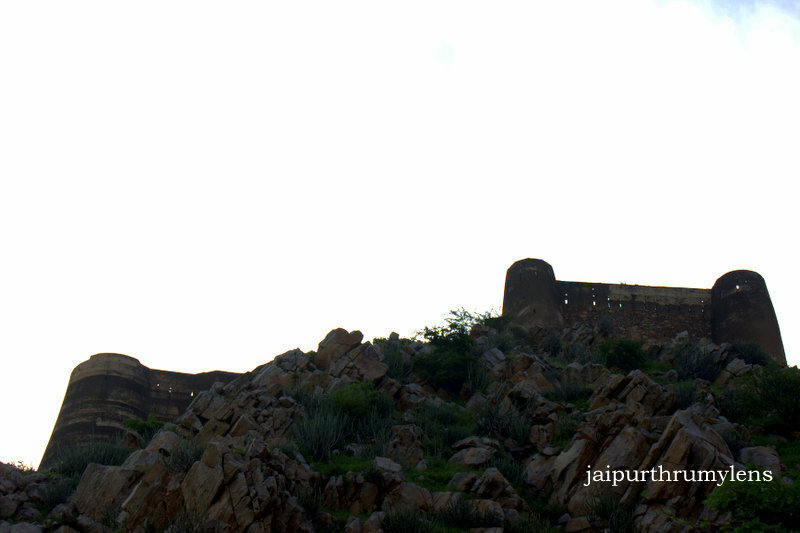 I’m sharing pictures of Achrol Fort and Achrol Palace, which is located 25 Km away from Jaipur on Jaipur-Delhi highway. Achrol Fort -from the distance! 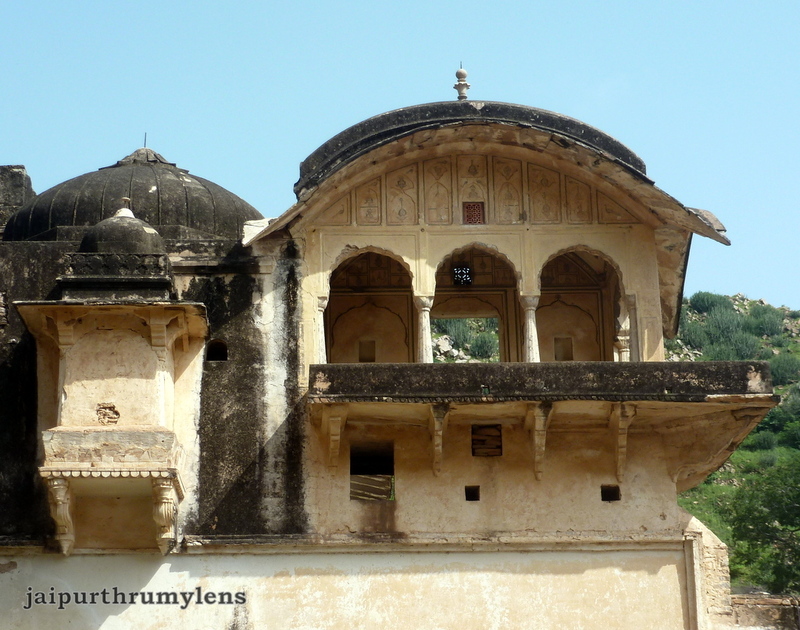 The fort belongs to the Achrol Thikana family, which is extended family of Kachhawa rulers of Jaipur. 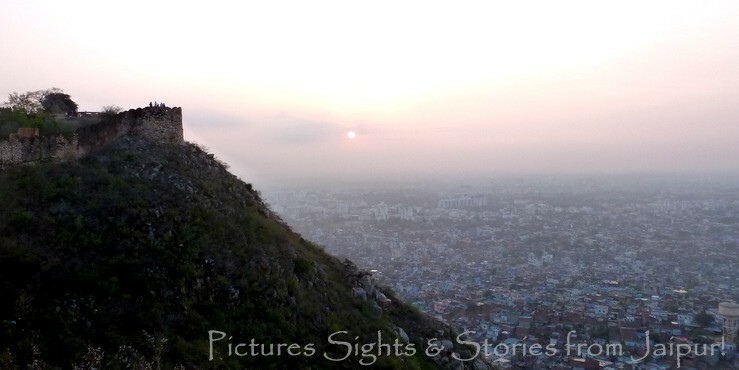 No records related to the history of this fort are available except that Achrol Thikana dates back to 1550 AD. 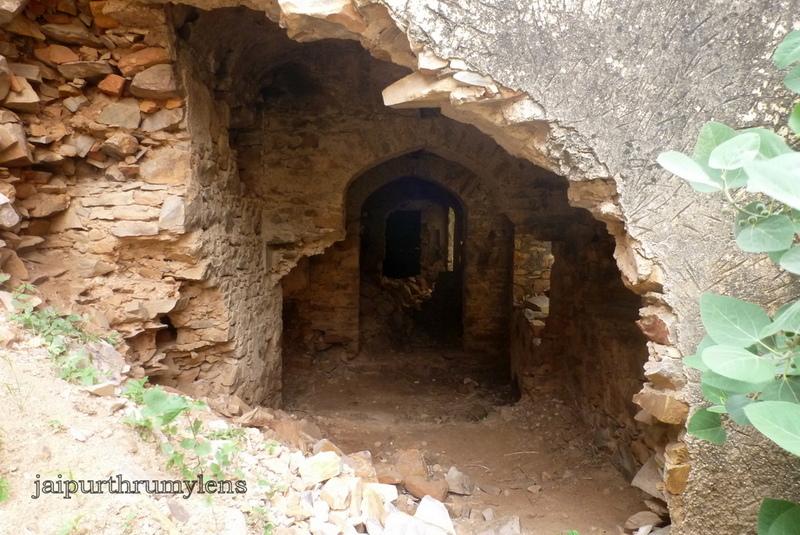 Achrol fort – lack of attention & repair, evident everywhere! Poor restoration! Bricks look out of place in these pillars. Heritage about to be lost? It seems some efforts were made for the restoration of the Achrol fort, but these efforts are poor and not in line with the procedures used by heritage restoration experts. 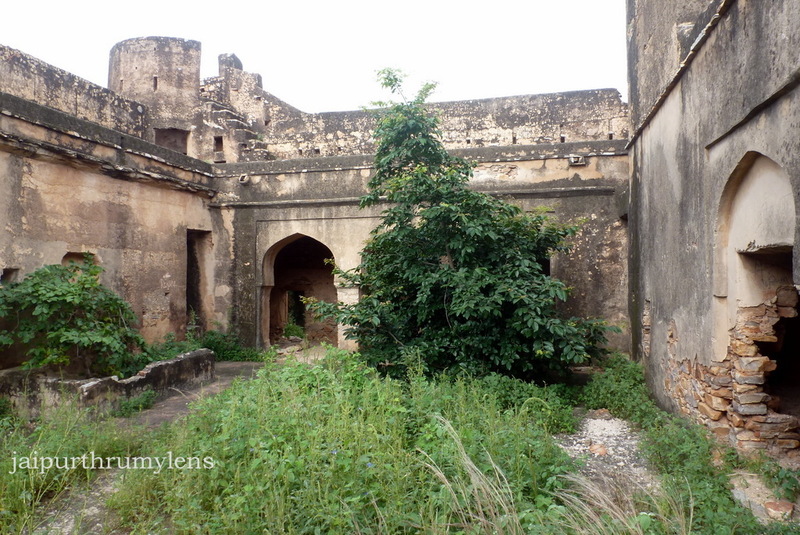 Inside the Achrol Fort – Overgrown grass, damaged structures & walls convey a sad story! Achrol Fort, as seen from the road level. 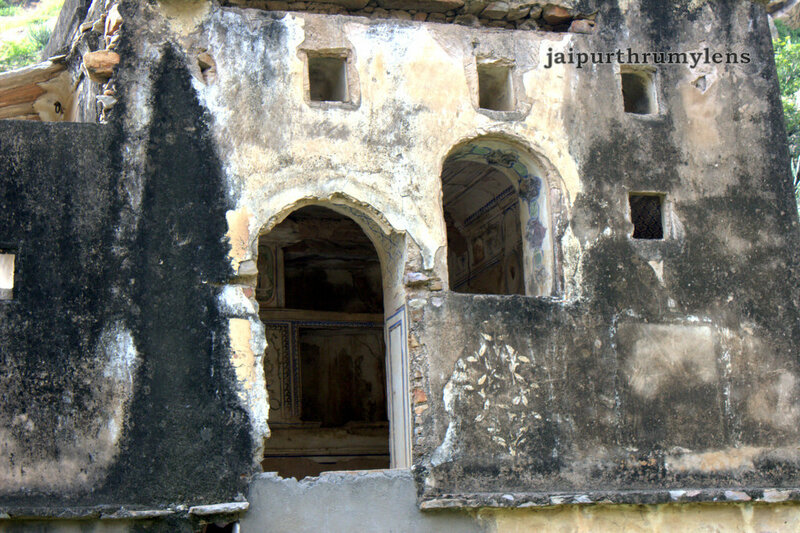 Achrol Palace is an old haveli located close to a path which leads to the Achrol Fort, inside Achrol village. 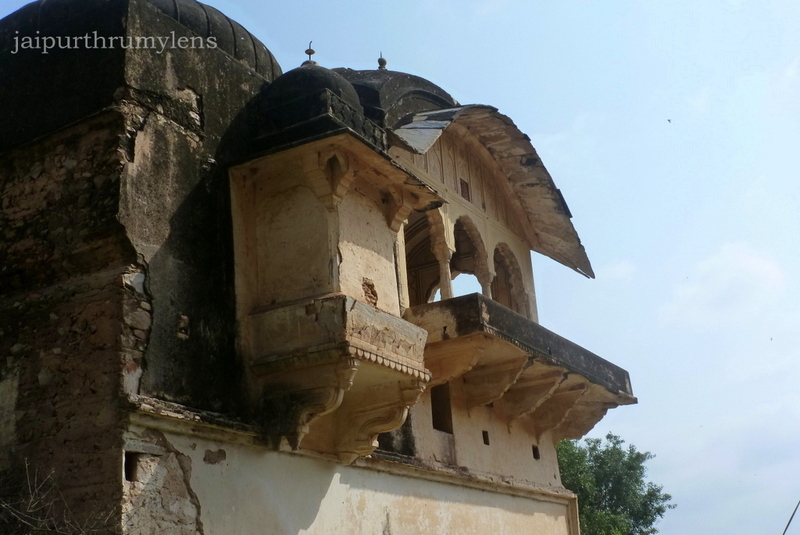 Tucked away from the Jaipur-Delhi highway, the old Achrol village with few old Havelis is pretty small. Areas adjacent to Jaipur-Delhi highway has grown considerably after the widening & development of NH-8 over the years but the old part still retains its own charm! 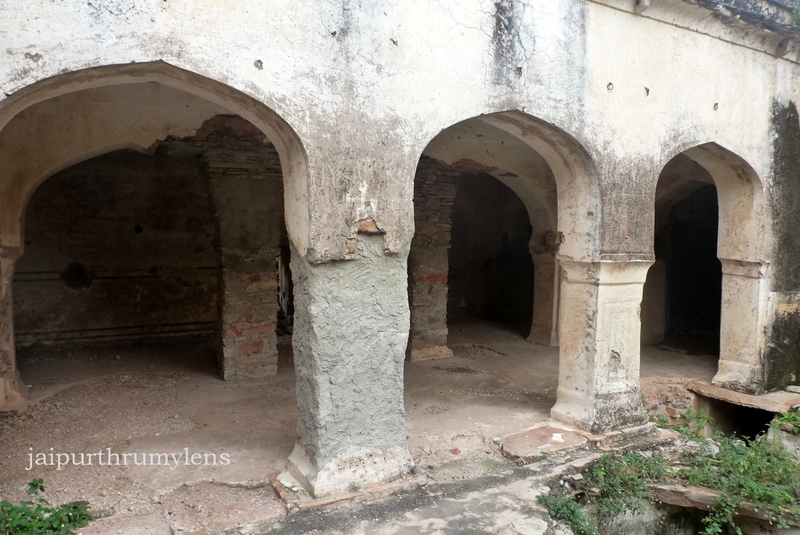 The fort had military & strategic importance while the Palace or haveli was used as a residential quarter. The front gate of this palace was closed. “court stay” …Someone had painted on the adjacent walls indicating that property was disputed. Notice the beautiful workmanship on the chhatri facade! 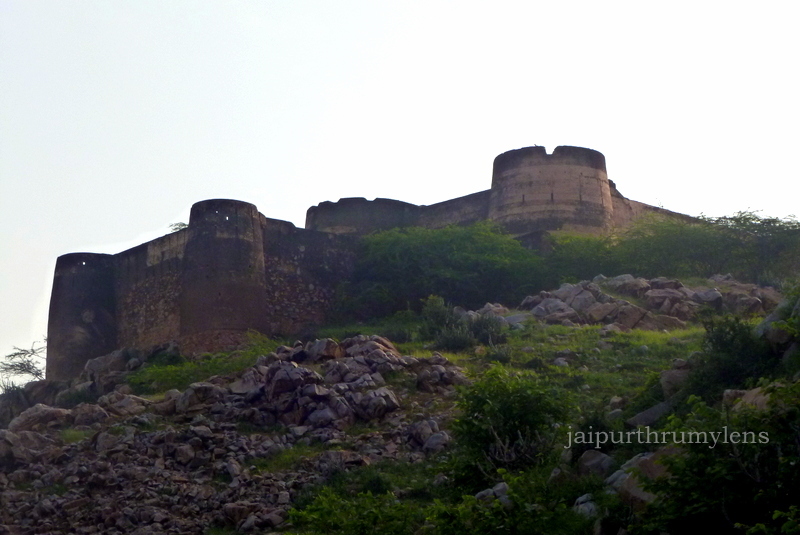 As far as Achrol Fort history is concerned, Achrol fort seemed to have been built as a strategic fort on the Delhi-Jaipur Highway and must have served as a forward post. The fort doesn’t have any residential quarters. 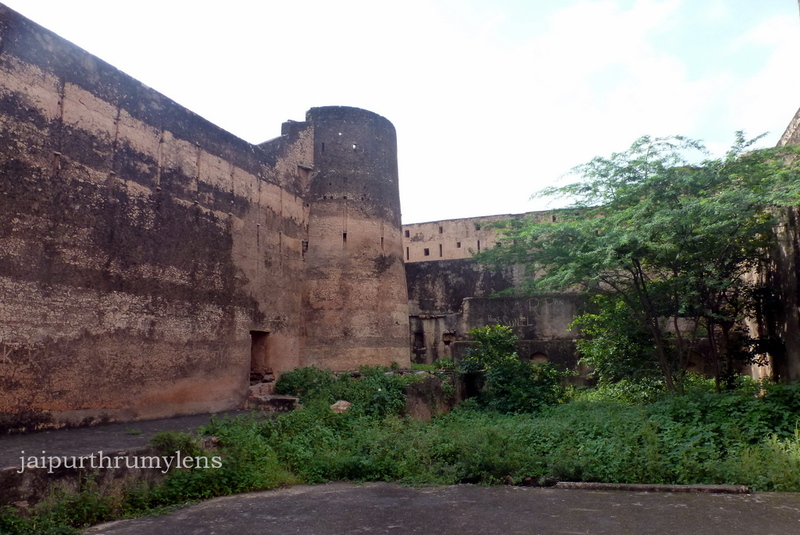 Both the Achrol haveli and Achrol fort are in bad shape. Without urgent attention and restoration, they will be gone forever! Loss of heritage? Surely YES! Do note that when we visited Achrol Fort there were signs that this fort is used by anti-social elements. A few individual trek operators have started taking people from Jaipur around Achrol fort for trekking and hiking expeditions and also rappeling. 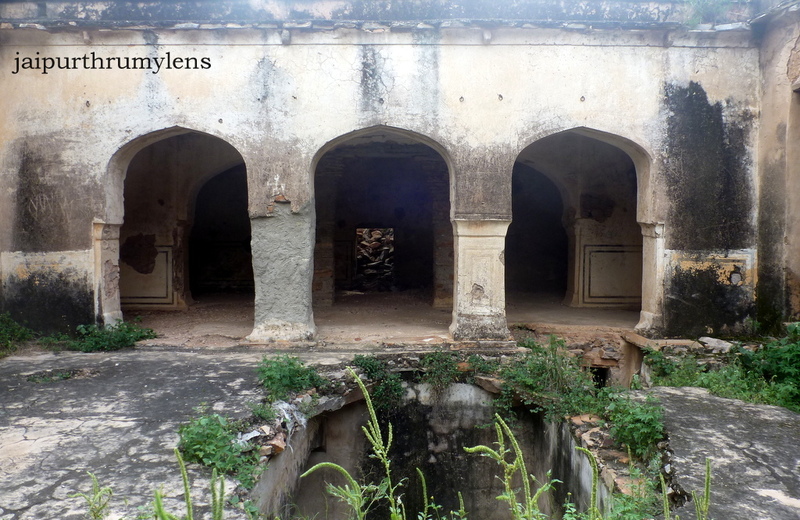 It is unfortunate that it is causing further damage to the fort and heritage as t is in a dilapidated state. Also, this fort is unsafe for rappelling. The local authorities must act fast and ensure that lives are not put in danger because of these activities. 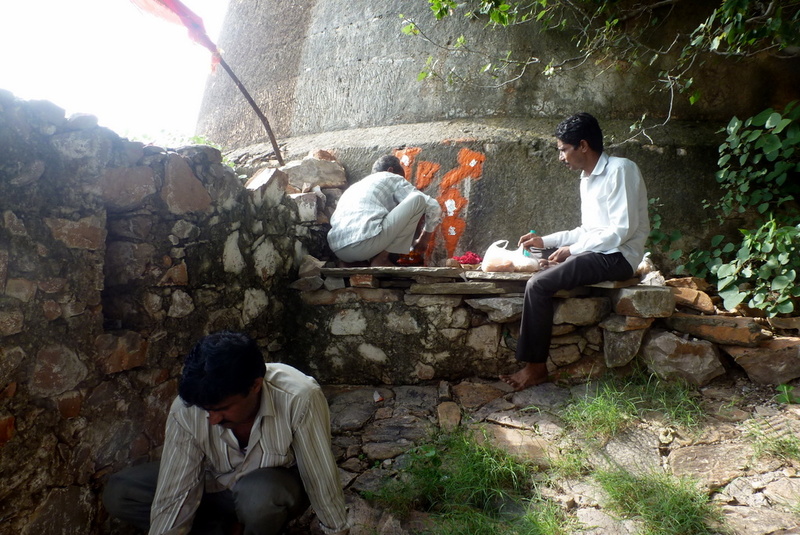 These forts are our heritage and not trekking or hiking spots. 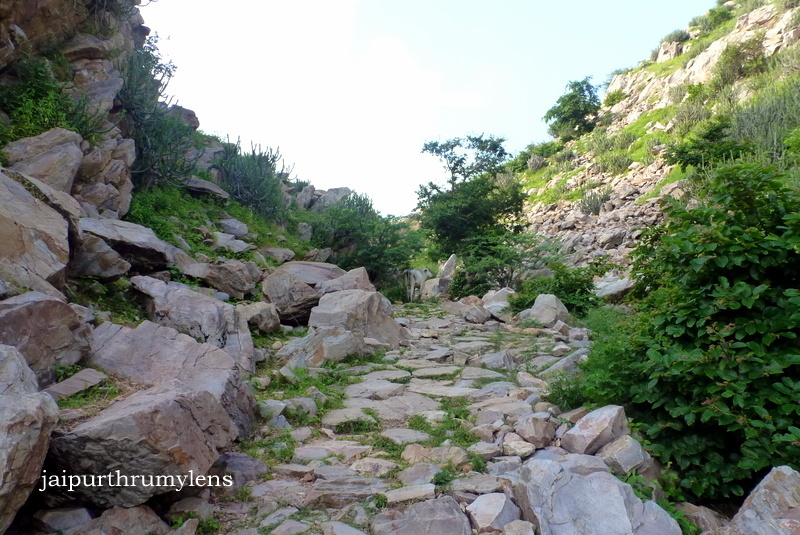 I will not recommend people to use Achrol fort as hiking and trekking place near Jaipur. Thank you for sharing! This blog was especially interesting. Peter! Thanks for visiting and checking it out. I’m happy that you liked it! So pretty and interesting too. Impressive fort and palace! I couldn’t help thinking how lovely it would be if the paintings were restored. With the way things are currently, it might not survive beyond 15-20 years! These paintings are quite unique to this area. thanks for visiting this blog! 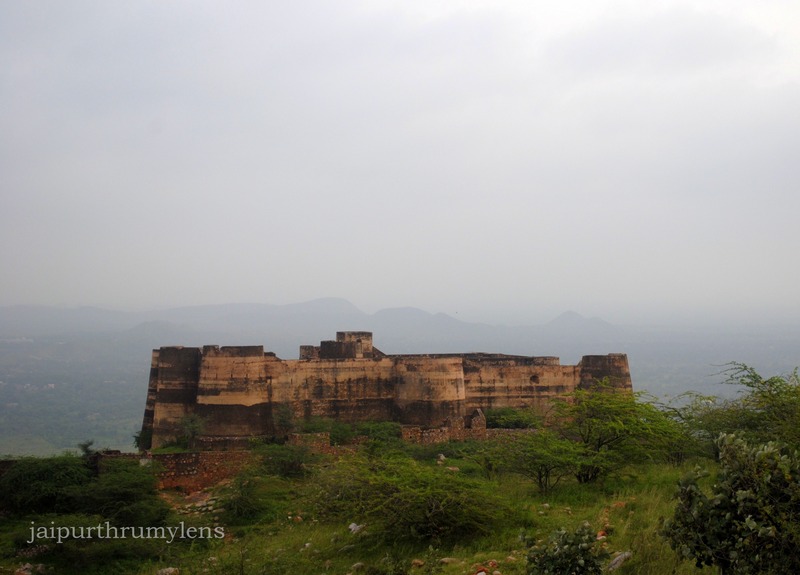 I had discovered this fort by chance during my last trip to Jaipur and absolutely loved it! Wish it was in a better condition but then loved the fact that it was so secluded guess which will not be the case if it is restored. 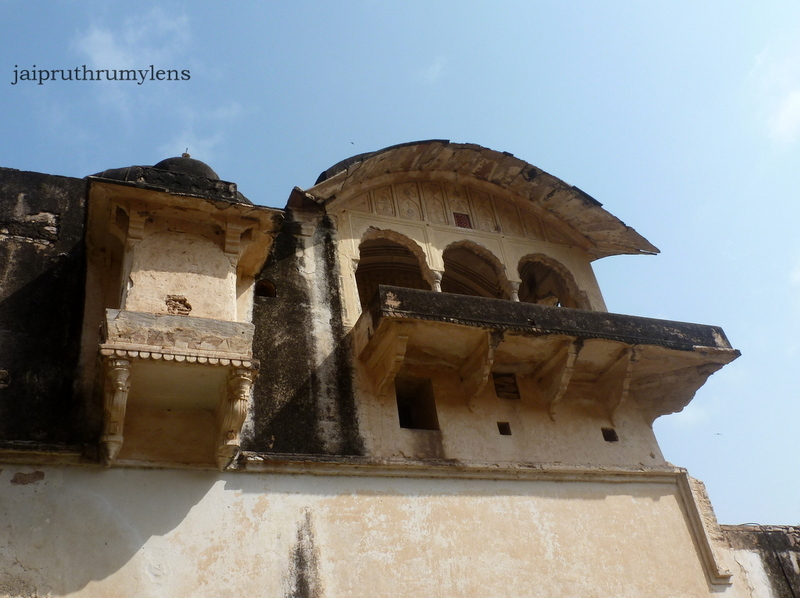 However, as per the locals now the palace in the village is getting converted to a hotel. Well this fort like many other forts in the vicinity of Jaipur were strategic forts, quite small and not meant to house people. the palace as per my information is engaged in court battle and same was mentioned on front gate. the family who owns it runs a popular heritage haveli hotel in Jaipur city. Just out of curiosity, how did you find out about this fort? it’s not on a tourist map. Well there are many in 100-150 km radius ! Yes true but most like Samode and all I have already visited! Interesting place, Arv. Some of the shots remind me of Fort Hathroi. Some aspects are similar. Both these forts are actually mini forts meant for strategic and defence reason. 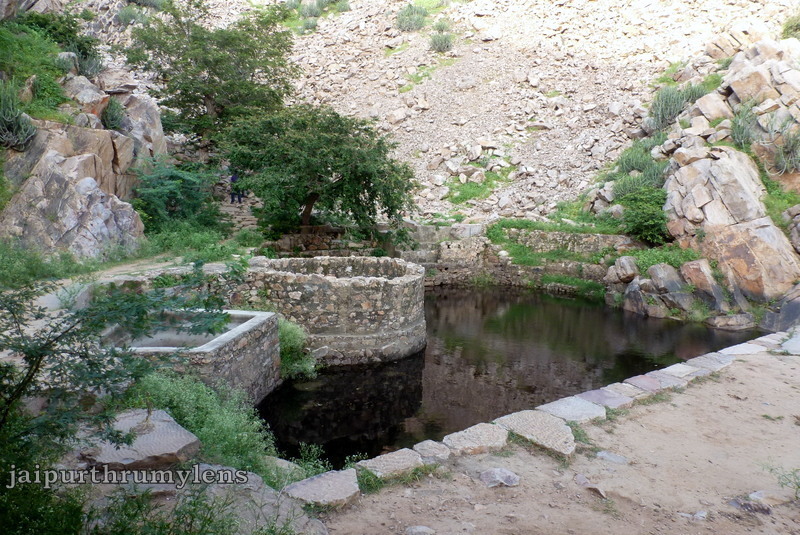 While Hathroi is in the city this one is approximately 30 km from Jaipur. Have you been to Hathroi Fort? Hi Arv. Not actually to the fort, but I stayed in a hotel that overlooked it. At the time, it was not obvious whether one could visit or not, or how to find an entrance. Mick, even I have not been to Hathroi fort. In fact, with so much construction around most people cannot even see this fort. I believe there’s nothing much in there and it’s in ownership dispute as per the information available. Perhaps I got the best view, then! Wow! The Achrol Fort and Achrol Palace seem so remarkable and outstanding! Is one day enough to explore them?